Peak PKC0J5 2-in-1 12V Heater Defroster Fan. This Peak 2-in-1 12V Defroster quickly defrosts windows and helps to heat cold vehicles. It features a mounting swivel base and a convenient pop out handle that is designed for easy removal of the unit. This 12V Heater plugs directly into your car's 12V port. 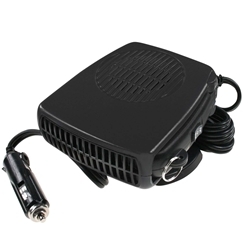 This Peak Heater is an ideal solution for your vehicle on those cold winter days.